Charley is one of the dogs here in the monastery. He comes and joins us for breakfast, lunch and the evening meal. For the most part he lays down on his blanket in the corner of the dining room, especially when we are having a formal meal. He knows the score, no snoring or deep sighs while we are silent! However during informal meals he snacks his way along the rows of knees licking up crumbs off our laps. While Charley stays with a particular monk he is a friend for all of us. There is a monastery, New Skete in New York State, which teaches a particular training method for dogs, Alsatians (German Shepherds) mostly I think. I’ve seen pictures of all of the animals rowed up in the refectory during meals. 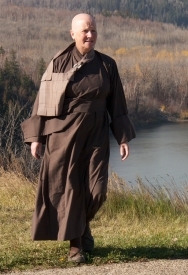 It’s part of the monks practice and training method to keep their charges with them at all time. There are many methods of animal training, some more effective than others. Some more apparently kind than others too. The good dog, bad dog system with plentiful treats as reward for obedience is a common one. Then there is the getting and keeping the animals attention, of keeping up constant contact. The animal and person work together, and it works because that way is rewarding in itself. I have a feeling this is the method practiced in the monastery already mentioned. Sometimes, just to highlight how conditioned we humans are and how conditionable (if that is even a word!) I talk about the reward method of training, in connection with religious practice. That’s practicing with a goal in mind. And, in contrast, I talk about the getting and keeping attention method. That’s paying attention to what you’re doing, being aware of what’s going on around you and remaining in contact with your surroundings. Not sure where I am going with this however, while I enjoy a treat from time to time, the second method can be constantly rewarding, if it is kept up. So I’d go for that way every time personally. I had a look at the website of the monks of New Skete. That is amazing. The idea of being with the dog all the time appeals to me absolutely.